1. 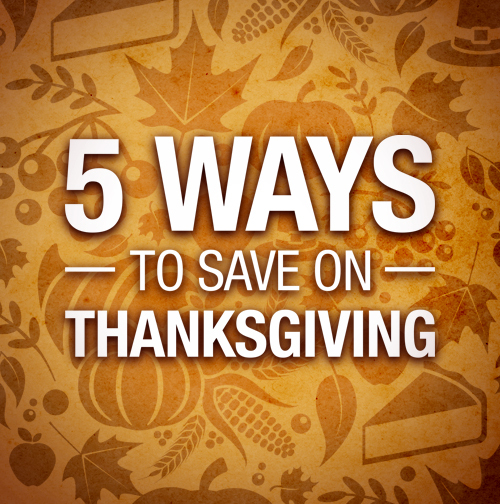 Shop off those Thanksgiving calories! Want to shed some of those delicious holiday meal calories? Put on your comfy shoes and head out to the shops! What better way to celebrate your family than by picking out the perfect little something-something? 2. Make a list and check it twice. Have a plan! Make a list of who you’re buying for and what you want to get them. That way you’ll have a clear focus. If you’re headed out to the shops, plan your route so you can save time. 3. Stick to your budget. You might score big-ticket items for a deal, but there will be more deals coming. Don’t grab and go. Stick to your budget. Odds are, the deals will keep coming and what you save in one area can be reallocated if needed. 4. Say it with me: “Technology is my friend.” There are tons of apps that allow you compare prices, scan bar codes and more! Make sure you’re getting the most bang for your buck by taking your smartphone shopping with you. 5. Come on, get social! Most retailers post their best deals on Twitter and Facebook. Go ahead and friend the stores you’ll most likely visit and get the scoop on deals early. 6. Beware of doorbusters. You can score some great deals, but know that they’re called doorbusters for a reason: to get you in the door to buy higher priced items. Stay strong! 7. 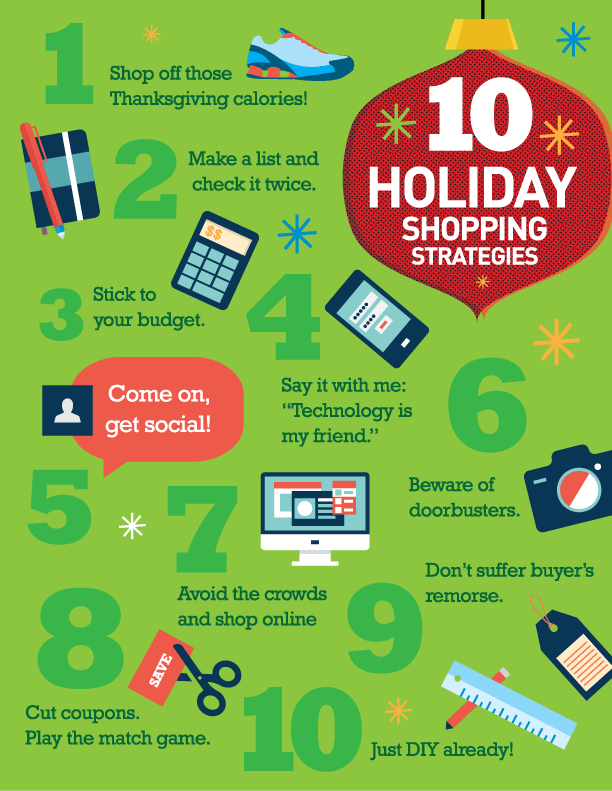 Avoid the crowds and shop online. If you want to avoid the frenzy, shop online. Stores will have deals throughout the holiday season — Cyber Monday — and beyond! Also, there are lots of voucher deals up for grabs daily on sites and apps like Groupon, Living Social and Pricegrabber. 8. Cut coupons. Play the match game. In addition to great deals, many stores will be sending out store coupons in flyers and via email. Clip and save! Some stores will match their competitor’s prices. Save yourself some extra trips and find out who’s playing the match game on the object of your desire before you go. 9. Don’t suffer buyer’s remorse. Retailers are becoming stricter on their return policies. Don’t over-buy and hope to return for full reimbursement later. Some stores will only offer a credit even if you have a receipt. Also, do your recipients a favor and ask for a gift receipt. 10. Just DIY already! Want to cut costs and take a more personal approach to the holiday? Make some of your gifts. Not only are they from the heart, but think of the savings! And, between DIY bloggers and Pinterest, you can find out how to make just about anything on the Web. Blood Drive: More than 227 Primerica employees donated 191 pints of blood to the Red Cross, saving over 573 lives. Relay For Life: Primerica team members help to raise more than $43,000 for the American Cancer Society. Gwinnett Great Days of Service: Sixty-five Primerica volunteers participated in the Great Day of Service event at Rainbow Village in Gwinnett County. Projects included major landscaping, a patio redesign and the construction of an outdoor play-set. Volunteer Day with Habitat for Humanity: Sixty employees worked with Habitat for Humanity to build a townhome for a deserving family in Tucker, GA. 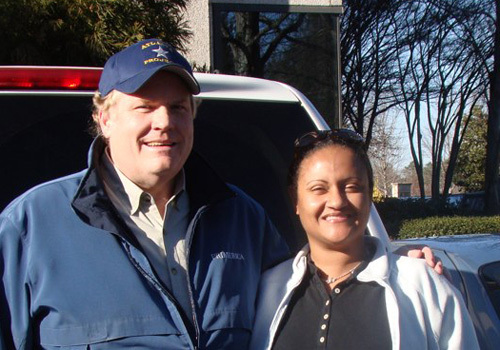 Meals on Wheels: Primerica employees helped deliver more than 100 meals each week to homebound seniors in their local community. Mentoring Program: Nineteen Primerica employees mentored at-risk students in the Berkmar Cluster Schools in Gwinnett County. Dress for Success: Employees reached into their closets and donated 30 complete outfits to provide professional attire for disadvantaged women who plan to interview for employment. The United Way Campaign: Through cash donations and payroll pledges for 2011, Primerica raised more than $50,000, exceeding their goal by $4,000. 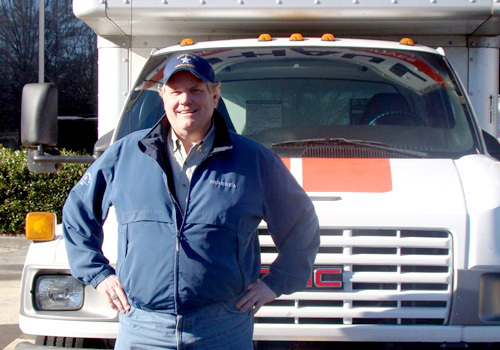 Food Drives: More than 16,000 food items were contributed to the Lilburn Co-op in 2010. Salvation Army Forgotten Angels: Employees “adopted” 100 children, providing gifts of clothing and toys to each of them during the holiday season. Operation Hope: In partnership with the nonprofit, Operation Hope, Primerica employee volunteers teach Financial Literacy curriculum. To date, 875 Gwinnett County Public School students have participated in the program. 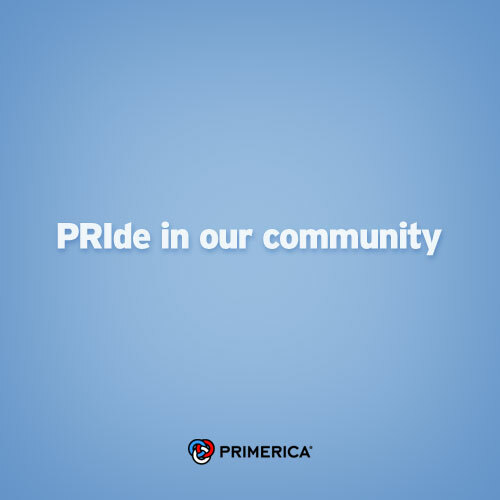 Primerica employees have already started making a difference in their community in 2011. They look forward to another year of helping others have a better future. Primerica Home Office employees have generously adopted 100 Angels from the Salvation Army Angel Tree this year, committing to provide toys and clothing to children in need during the holiday season. The gifts will be delivered to children in the Gwinnett County area. It’s holiday time, and for many families struggling through economic hardships, the season doesn’t hold the promise that it does for so many of us. Some parents need a helping hand in order to “make the season bright.” That’s why the Primerica Home Office has made the Salvation Army Angels program part of its regular calendar. This year, the response was extraordinary. All 100 Angels were quickly adopted, and several extra items were donated! At least five bicycles and a crib were among the items contributed beyond the Angel list for whomever may need them. The Home Office family has proven once again this year that, even during rough economic times, helping families is a Primerica way of life. The devastation of the recent earthquakes in Haiti has touched the lives of people across the world. While droves of friends and family were receiving horrific news, one of Primerica’s own, Regional Vice President Peggee & Jarrin King, was elated to receive word that her parents, missionaries in her home country of Haiti, were alive. They were alive, but lacking the basic human necessities to keep themselves – and the people who depend on them – well. The 7.0-magnitude earthquake that struck the nation of Haiti on January 12, 2010, flattened homes and crumpled government buildings. Because of the tremendous loss of life and the overwhelming need for food, water, shelter and medicines, the International Faith Fellowship Ministries, Inc. (IFF) was in dire straights. The Liberuses, Peggee’s parents and the founders of IFF, sent word that they needed help, and the Primerica community responded right away. 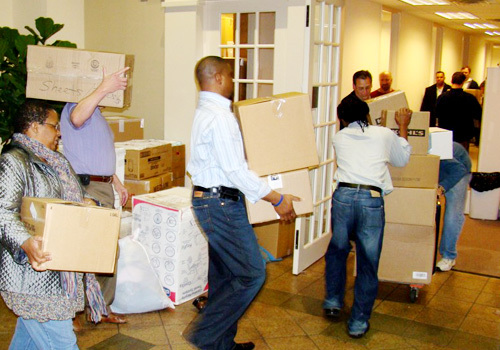 Senior National Sales Director Andy Young coordinated an effort that collected more than 850 boxes of food, medicine, clothing, toiletries, generators and more. 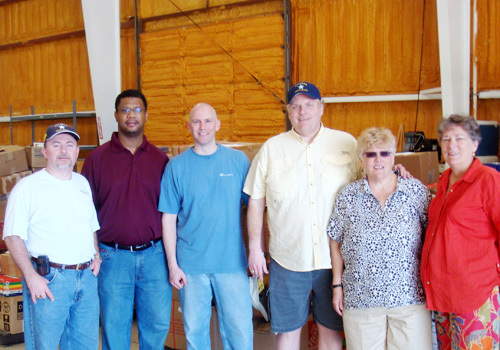 These donations, along with monetary gifts, filled two moving trucks that Young, Jarrin King and two other Regional Vice Presidents – Chris McHugh and Joe Redd – drove to Venice, FL, and loaded aboard Agapé Flights. 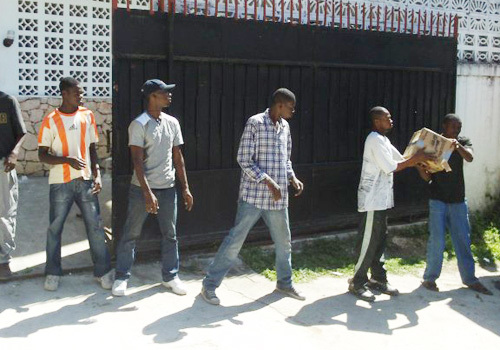 In Haiti, Peggee’s family met the plane and distributed the more than 30,000 pounds of donated goods. Through these contributions given by the Primerica representatives and Home Office family, hundreds of people will be able to meet some of their most basic needs and begin determining how to go on from here. To boot, Primerica made a corporate donation of $10,000 to the American Red Cross to help in the Haiti recovery efforts. Individual employees have also made personal financial donations through many of the aid sites that have been established in the wake of the earthquakes. Primerica said “yes” and came through for people who desperately need help right now. They delivered on a promise to do what’s right for families … starting with their own. If you’re interested in giving specifically to the International Faith Fellowship Ministries, Inc., they are a 501(c)3 organization. You can make financial gifts at any Wachovia Bank.